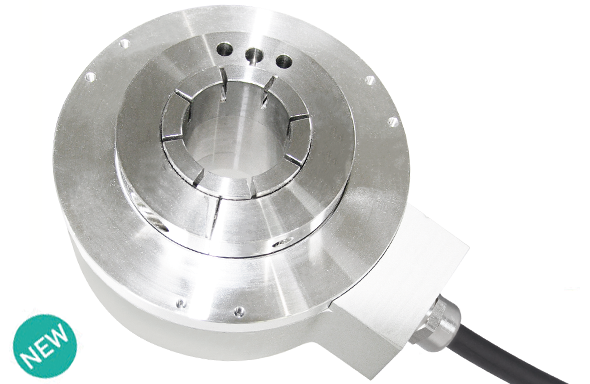 POSITAL has extended its portfolio of rotary encoders with a new family of through hollow incremental encoders. These devices are designed to be installed with the machine shaft passing through the sensor. They can be used to monitor rotary motion in a wide variety of machinery, including servomotors, material handling equipment and printing presses, offering cost-effective, space-saving solutions. They can be easily installed between the body of the motor and other components mounted on the shaft. POSITAL’s through hollow encoders are available for shaft diameters ranging from 3/8 inch (9.5 mm) to 1-3/4 inch (44.5 mm). The smaller units (up to 14 mm shaft opening) have an external diameter of 2-1/4 inch (58 mm), while the larger units (5/8 inch to 1-3/4 inch shaft size) have external diameters of 3 or 4 inches (77 or 100 mm). Available resolutions for these devices extend from 360 PPR to 4096 PPR (pulses per revolution). All through-hollow encoders have rugged aluminum housings and environmental protection rated at IP65, ensuring longevity and high levels of operational safety. All variants are available with a variety of communications interfaces , including RS422 (TTL) 5V or 11-30V and Push-Pull (HTL, 5-30V). Connection options include built-in cables or MIL-type connectors.